Exhibit 2018 - The Association of the 8th Canadian Hussars (Princess Louise's) Inc. The Main Exhibit for 2017 "THE DITCH"
Each year the display will be changed to reflect the events that took place one hundred years ago. In 2015 we remembered the April days in 1915 when the Germans attacked using poison gas for the first time. It was the Canadians who bore the brunt of that attack and the Canadians who, after desperate fighting, with no protection from the poison gas, stopped the German advance.3000 Canadian men died in those few days.The trench in the museum shows a wounded Canadian trying to keep the poisonous chlorine gas out of his lungs using only a urine-soaked handkerchief. Various panels and photographs explain how gas was used and how protection against it was developed. 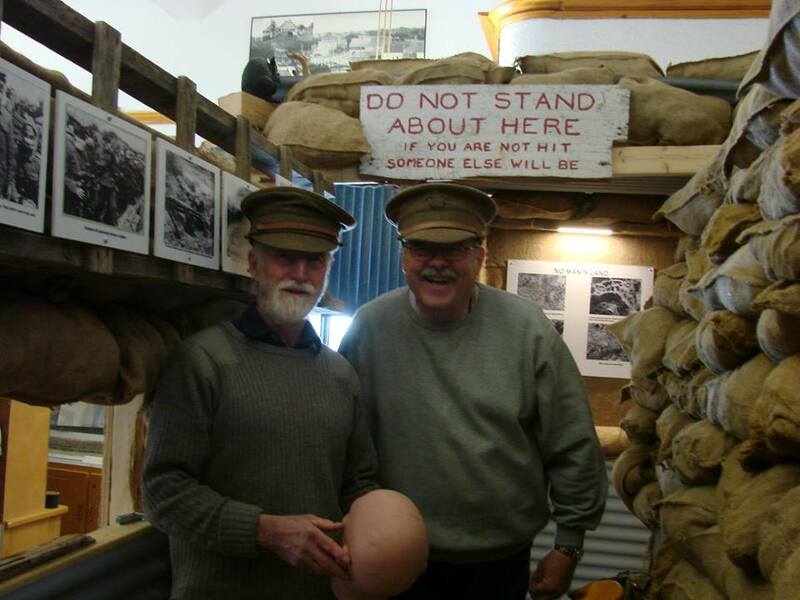 There are also sections on life in the trenches - the hazards such as lice and disease, and a section on the food the soldiers ate. In 2016 we shared information regarding the great battles at Mount Sorrel and the Somme in which members of the Hussars took part. Twenty our thousand Canadian casualties, both killed and wounded, occurred in this period of time. The Canadian army had taken many strides forward during this period. The replacement of the Ross Rifle with the Lee Enfield would reduce the number of weapon failures during combat. The Canadians were also equipped with steel helmets to reduce head injuries,and waterproof footwear and rain gear to reduce trench foot and other illnesses. New innovations on the battle field would include trialling the creeping barrage, and the use of armoured tanks on the battlefield. By the end of 1916 the Canadians were starting to be recognized as a potent military force. Our display for 1917 focuses entirely on the Battle at Vimy Ridge, April 9,1917. The display shows the battlefield map of this most significant battle, one of the most significant in the history of the Canadian military. Walking down the trench one can hear the sounds of battle, imagine the life of the soldiers as they waited to go over the top that morning and get a sense of the immense planning and preparation that went into the battle, most of which was based on the experiences faced in the latter parts of 1916 and the efforts to improve capabilities, change methods of operation and reduce casualties. Our plans for 1918 anniversary will be to track the path of the Canadian Army as it moved from battlefield to battlefield and essentially used as the British Expeditionary Force’s shock troops to lead the advances in a number of battles that year. For the whole year the Canadian Army would for the first time in history under Canadian command and control and would become recognized as an elite and effective force. The issues of conscription and it’s impacts on Canada itself will also be revisited. Just as the Battle of Vimy ridge was seen as a nation builder, conscription which was implemented in 1917 was an issue that could have destroyed the nation as well.